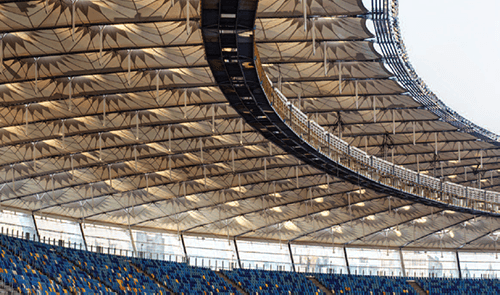 We supplied the steel cables and connecting elements for the spoke wheel roof structure for the upgrading of the original stadium. The stadium is now completely modernized and ensures unrestricted views of the whole playing surface from any position around the seating bowl. The Locked Coil, Spiral Strands and Stainless Steel cables were manufactured at our Doncaster, Willington Quay and Gelsenkirchen sites over a period of 18 month, from April 2010 to October 2011. There were over 4,000 components manufactured for the roof structure, with a total weight of 760 tonnes. The difficult technical requirements and a tight planning and production period made this project particularly challenging and stretched our teams to the full. A number of teams across the Group collaborated and worked incredibly hard to ensure we ultimately met the exacting requirements of our customer, including the quality assessment of our product on the construction site by a number of consultants and architects. The stadium’s first event, a football match between Germany and Ukraine, took place on 11 November. The match ended in a three-all draw, and for Bridon brought us a step closer to achieving our vision to become Global Technology Leaders for demanding rope applications.